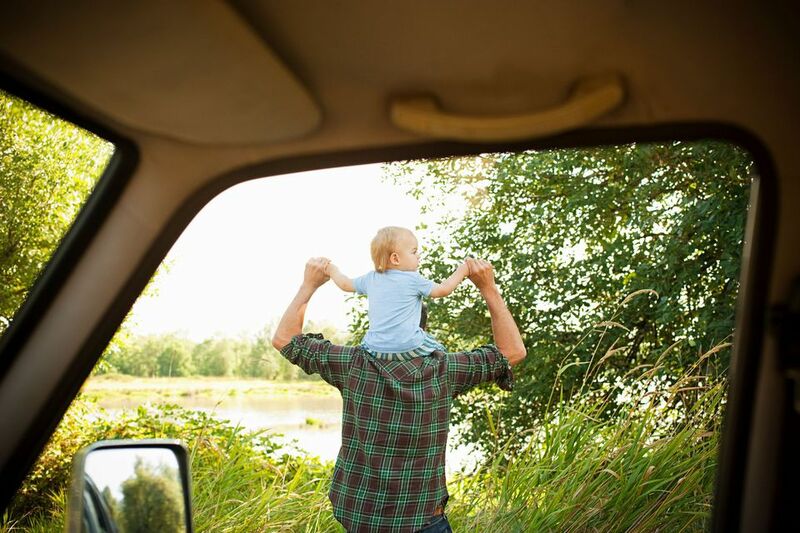 Road trips with an infant can be stressful, but they don’t have to be. You'll no doubt want to take the baby to visit the grandparents and there are vacation destinations geared for families with infants, some even offering child care services. You may be surprised at some of the simple things you can do to keep your little one calm and quiet during your trip. Whether you’ll be on the road for five hours or five days, here are 10 tips to help your vacation go as smoothly as possible. While one person is driving, have another sit in the back with the baby. Having that caretaker in the back seat can help address issues as they arise—preparing bottles, wiping up, curing boredom with some old-fashioned “peek-a-boo”—which can help minimize stops and/or avoid total meltdowns. It's an old bit of wisdom, but "sleep when the baby sleeps" is solid advice during a road trip with kids. When the baby is sleeping, the person in the back should try to rest, too, so they can be refreshed enough to take over driving when the driver gets fatigued. Any number of things can go wrong on a road trip—a flat tire, bad weather, food poisoning— but those hiccups become exponentially more stressful with a young (likely screaming) infant in tow. Accepting that going in, and having a sense of humor about the situation, can go a long way to help ease the tension. After all, the difference between a fiasco and an adventure can be as simple as your state of mind. One way to make light of unpleasant situations is to make a game out of them. For example, put together Baby Road Trip BINGO cards where spaces are filled in with any and all potential disasters—think "blow out in the car seat" or tiny victories like "finished a whole podcast." That way, even bad situations are wins. It’s a bit uncomfortable for the parents, but then again, so is a screaming child with no exit in sight. Driving at night means your baby will spend more time sleeping and less time awake and hungry/bored/needing changes. You’ll be able to drive for longer stretches without needing breaks. A great way to maximize drive time is to time your departure so that it coincides with bedtime. Go through your whole routine (bath, pajamas, bedtime song—whatever your nightly ritual entails), but put the baby down to sleep in the car seat instead of the crib or bassinet. Drive as long as you're comfortable—or for as long as the baby is sleeping—but be sure to switch drivers, caffeinate, and rest when needed to avoid driving drowsy. You might be able to go six hours without using the bathroom or needing to eat, but the baby likely can't. Plan for stops every 1 to 3 hours during the day and 3 to 6 hours at night to change diapers, stretch legs, eat and change sweaty or spit-up ridden clothes as needed. To avoid unnecessary stops, make a checklist of items that you go through during every break so you don’t forget anything—think changing the baby’s diaper or clothes, using the restroom (for those not in diapers), and refreshing key supplies. While scenic overlooks and long stretches of open road might seem like the very things that make a road trip worthwhile, they can also make it difficult to find help or reprieve when you need it. Choose a route in advance that has frequent access to food, 24-hour gas stations, restrooms and service areas. Even better, plot out some pit-stops in advance—including some potential hotels if you think you might need a real rest—so you can pull over when necessary. You might have a giant suitcase with everything you need to survive traveling with an infant for an extended period of time, but that's not what you want to be digging through at 65 mph while a baby is screaming in your ear, or while parked at a dodgy rest stop in the middle of the night. In addition to the baby kit, be sure there's one for the adults, too. That kit could include: relevant car-adaptable phone and tablet chargers, tablet or e-reader, high-protein/easy-to-eat snacks, sleep aids, sleep mask, a small pillow, earphones and earplugs. Babies can get stiff and uncomfortable after sitting for hours in their seats, just like adults. Read up on some infant massage techniques that you can modify to use either while driving (if you’re on backseat duty) and during stops. Gently massaging legs and feet, in particular, can often help calm a fussy baby long enough to get you to a good stopping place where they can stretch out their legs in earnest. When it comes to fussy infants stuck in car seats, you want to be prepared with a variety of tools at your disposal. Singing songs can often be more effective than the radio at helping to put a baby to sleep, calming them when they’re fussy and entertaining them when they’re bored. Try to pick songs with simple melodies, but where verses can be added or improvised. Taking turns inventing new lyrics can help break up the monotony. With or without an infant, standard prep and safety precautions should be followed. Make sure a spare tire, car jack and tire iron are ready to go—or failing that, a can of fix-a-flat. While packing the car, be sure not to obstruct the driver’s view, including in the rearview mirror. And always take steps to pull over to well-lit areas when stopping at night. If you’re tired, if you’re frustrated, if everyone in the car (including and especially your baby) can’t take another second on the road—stop. It’s okay. Find a place to rest, and give yourself a few minutes or hours to regroup. Most hotels will take bookings any time of day, and many provide cribs in the room upon request. Take a nap in a real bed, or freshen up with a hot shower and a meal at a real restaurant. Giving yourself and your baby a chance to reset can help make the rest of the ride go more smoothly.